Beth Dooley: Discovering our Roots! Mill City Last Call! It's the last Saturday for the Mill City Market and a great time to discover our roots. 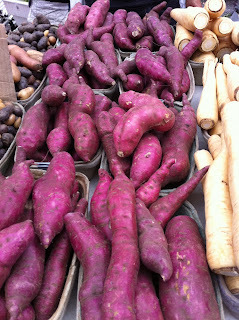 Sweet potatoes, parsnips, rutabagas, carrots in all colors, turnips, potatoes, things that grow underground. Stock up, these are keepers that, unlike tomatoes or tender peas, don't have to be eaten right now. While you're grabbing the best of this season, think about enjoying great local produce all through the winter and sign up for a CSA. Many of Mill City Market farmers have late fall and winter shares. and then come on Down! Our northern sweet potatoes are prettier, sweeter, denser and smaller than those that grow down south. Delicious simply roasted off in the oven until tender, they're also terrific in this luscious gingery soup. It's topped with a spicy, tart salsa made of our snappy local apples. Quick and fresh! Melt the butter in a soup pot over low heat and saute in the onions until they're very soft, about 10 minutes. Add the garlic, ginger, cinnamon and nutmeg and cook another minute. Increase the heat and add the sweet potatoes and enough stock to cover. Bring to a boil, reduce the heat to medium-low and simmer, partially covered, until the potatoes are very soft, about 15 minutes. Puree the soup in batches and return to the pot or use an immersion blender. Stir in the coconut milk, cider, honey and salt and pepper to taste. Serve warm with the Apple-Mint Salsa (recipe below). This lively fresh salsa sparks the sweet potato soup. It's also delicious on grilled chicken or served as a compliment to local cheeses (especially Shepherd's Way Big Woods Blue). Toss all of the ingredients together in a bowl and serve right away. Yum! I can't wait to give this soup and salsa a try, Beth. Sounds oh-so-delish!